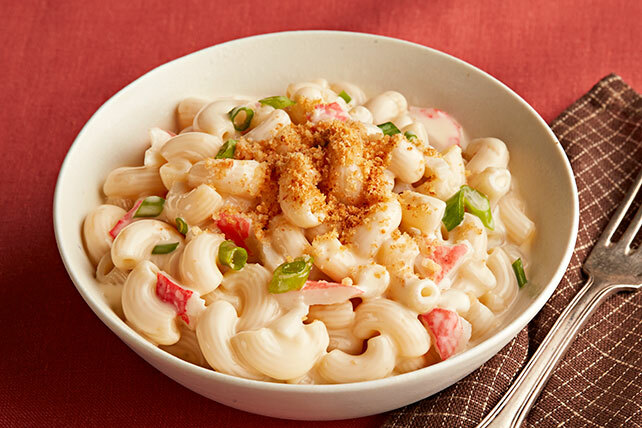 Make a casual dish fancy with Crab and White Cheddar Mac and Cheese! Use imitation crabmeat or cooked, cleaned shrimp in your white cheddar mac and cheese. Prepare Macaroni and Cheese in large saucepan as directed on package. Meanwhile, melt butter in small skillet on medium heat. Add bread crumbs; cook 3 to 5 min. or until golden brown, stirring frequently. Remove from heat. Add crabmeat and onions to Macaroni and Cheese; mix well. Cook on low heat 3 to 5 min. or until heated through, stirring frequently. Sprinkle with bread crumbs. Prepare using coarsely chopped cooked cleaned shrimp.